Responding to numerous customer requests, Armourlite has added the AL623 to the Caliber Collection of Military Grade Sport Watches. The AL623 is essentially the same each as the original AL603, but with a Black PVD Stainless Steel Bracelet in place of the original nylon strap. 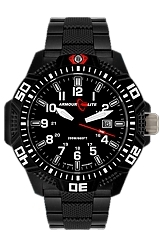 The Caliber Series from Armourlite Watches feature a tough and durable polycarbonite case, a virtually scratchproof sapphire glass crystal, one-way rotating bezel and are depth tested to 200 meters (660) feet. The model AL623 has a black dial with white numerals with red accents and the above mentioned Stainless Steel Bracelet that matched the black color of the watch through the use of Physical Vapor Deposit (PVD) coating of a tough and durable black plating. The dial is fully tritium illuminated, including the second hand for superior night time visibility. It simply one of the best military tritium watches on the market today.